On your FileZilla server, open FileZilla Server Options. 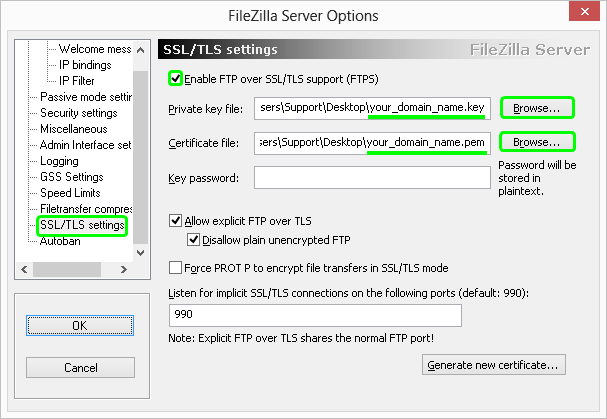 In the FileZilla Server Options window, in the tree on the left side, select SSL/TLS settings. On the right side, under SSL/TLS settings, check Enable SSL/TLS support. In the Private key file box, enter the location of the key file that you generated when you created the CSR. In the Certificate file box, enter the location of the .pem certificate file that contains the server certificate + intermediate certificate. On the first connection using the FileZilla client, you are presented with the certificate files from the server. 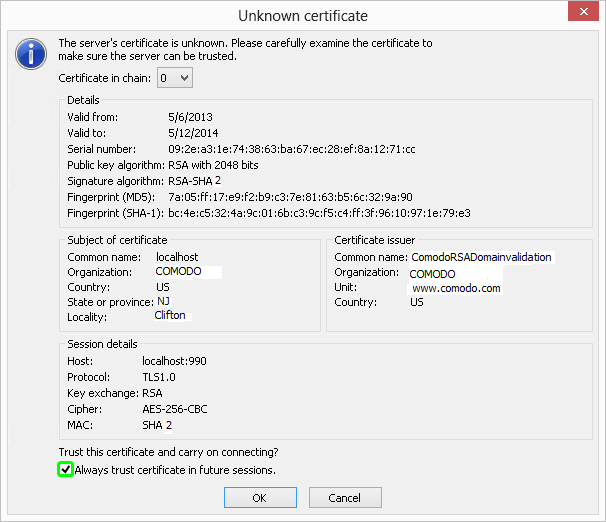 To avoid receiving this prompt on future connections, in the Unknown certificate window, check Always trust certificate in future sessions, and then click OK.